Please contact your practitioner directly to make or change an appointment. Some services are now also set up on our online booking system. 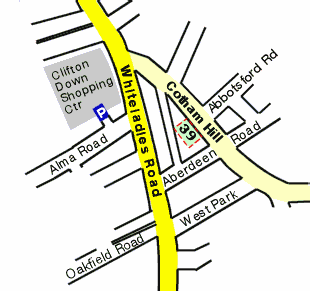 We are located at 39 Cotham Hill, which is opposite the Clifton Down Shopping Centre on Whiteladies Road. The clinic is up the steps by the 'Health Hub'. On street parking outside the clinic is metered at a rate of £1 per hour for a maximum of 3 hours between 9am-5pm Monday to Friday. Parking is free on weekends. There is a multi-storey at Clifton Down Shopping Centre 5 minutes walk away. From Bristol Temple Meads or the city centre, to the Clifton Down Shopping Centre. Bus numbers 1,8,9,40,41,54,99,624,x14. The Severn Beach line from Bristol Temple Meads stops at Clifton Down train station, Clifton Down Shopping Centre.